The National President of Nigeria Union of Road Transport Workers Association of Nigeria (NURTW) Alhaji Usman Yassim on Thursday congratulated Governor Godwin Obaseki for his success at the 2016 gubernatorial election saying his victory shows that the people wanted continuity and consolidation. 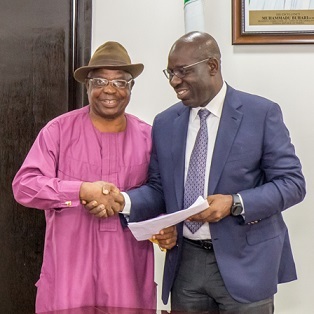 The President, represented by his deputy, Chief Elijah Uwamakpo expressed confidence in the steps Governor Obaseki has taken since he assumed office, noting that it is an indication of his ability to lead. Although he admitted that the governor has a great task before him in developing the state, Yassim revealed that the group has absolute trust and confidence in his ability to meet the challenges ahead and transform the state beyond expectations. Meanwhile, Governor Obaseki, for his part, urged the NURTW to study the state’s model for better collection of revenue from members of the union, explaining that with the electronic method of collecting revenue, previous lapses would be addressed. He explained that revenue collection had to be perfected because it is not sustainable to run Local Governments in the state on Federal Government bailouts. Analysing the dangers it posed, he said that local governments were unable to meet their financial obligations because revenue collection had been contracted out and the money accruable to the government went into private pockets. “In the last three months, we have put in the laws; we are putting the technology in place to ensure the process is successful. The process will ensure the money due to the local and state government gets to them and it will be collected seamlessly. We don’t want to collect cash anymore as collection will be done electronically”, he said. Continuing, the governor said the ban became necessary because it was difficult to separate the collection process, adding that the new process would ensure the separation as the system would address the problem of revenue loss. He, however, appealed to the NURTW to exercise patience as the process would be finalised in a fortnight and would be devoid of harassment, molestation, and intimidation.